It doesn't take more than a few steps inside your local discount warehouse before you find an action figure, scribble-pad or shampoo, blazing a knock-off image of a Marvel hero, with the product of equal quality. 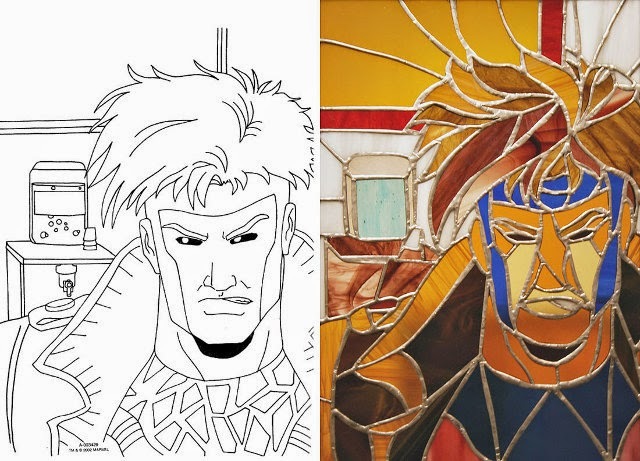 Brandon Bird forked out a few bucks for an X-Men colouring in book that was either plagiarised or shows Marvel has no quality control, and offered a page to each of his friends to interpret as they see fit. From a Beyonce Rogue singing Single Ladies, to Magneto using his powers to lift half a dozen screws, the team really does prove you can actually polish a turd. Good I miss colouring in books that have an actual story to them. Remember the old Secret Wars ones? Wolverine and Spider-Man vs Dr Octopus and Magneto? Those were the days. Kids these days don't know what they missed. So you don't miss any of Brandon and co's efforts, click this here handy jump. I have that X-Men coloring-book. I have a few Marvel ones like that... I used to oil-pastel or acrylic paint over them to make them look cool/good. Not nearly as artistic as some of those- but the same basic concept. How bout that King - small world huh? I used to have heaps of Transformers books as a kid. I used to love those things. Never got too creative with them though. Dude, snake Cyclops is hella scary. He shoots friggin' snakes from his eyes!!!! Not if my new totally original comic 'Snakeclops' doesn't beat Marvel's imitation to the racks! Meanwhile I'll never look at Jim Lee's Rouge the same again.